We are at it again talking about that gut health and secret power of your microbiome. Today we focus on the part of the microbiome in the lungs. The microbiome covers basically all of your internal organs. The body is far from the sterile monolith that we have been taught about. These microorganism inhabit and assist you in every step of your life. We need to learn how to take care of them so that we can have a great life. These organism help you break down and get all the nutrients that you need from your food. Family by us learning to work with the system we have been gifted with we can overcome and conquer all ailments. This little bit of information can be life changing if we start to use it. Every article that I read suggest that you begin adding probiotics to your diet. Probiotics add healthy and helpful microorganisms. Of course you know by now that GNJ has developed a product that can help with this process. The original reason that I started brewing "That Ambrosia" was to help others. I liked brewing, but to be able to help others was an added blessing. Now what I want to do is to go one step further and help people by teaching them how to make there own Jun. For more information please read my post about "That Ambrosia". As well as sending out "That Ambrosia" I am now able to send out the actual SCOBY (symbiotic culture of Bacteria, and Yeast). This is part of the secret sauce. You will be able to brew your own Jun and start the process of maintaining your health by adding probiotics to your daily life. I am really excited about this step, and I know that some will say why would I provide part of the secret that I am building upon. My answer is simple, there are too many people in my community that are sick from diseases that can be dealt with by simply adding this drink. I believe that those that will buy bottles from me will buy bottles from me. The bigger picture is that in every city in the U.S. that I have been in I run into sick people, and for me to hog something that can help them is, in my opinion hypocritical. How can I talk about Culture Building, and Family but hide the secret that can help so many. Most of those that are supporting the Journey are doing it because they believe in my work, and they don't have the time to do what I do. In our tribe we all do what we are good at, just like the microbiome. 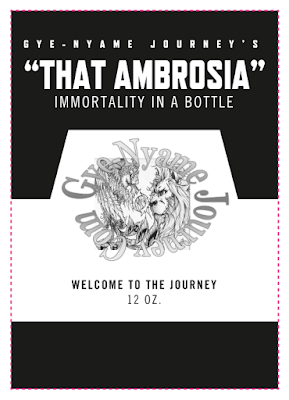 For those that are interested in supporting the GNJ Click the link, GNJ's "That Ambrosia" and support. We will contact you and get the shipping and handling together and ship your gift. Remember "That Ambrosia" is a gift for family and friends only. I want people who are driven by something deeper than just being a customer. I am looking for my extended family, I am looking for those who read the articles, watch the videos, and podcast. I am looking for those who want to move to greatness so that we can help each other move up, rather than cultivate a parasitic type of customer relationship. We are building, if you want to help sign up and let's move. Once you sign up you will receive the videos where I am showing you how to brew your own. Help me spread the Culture, "That Ambrosia" is the staple of those that belong to GNJ.